Each day is a new journey and the first things you do set the theme for most of your day. Creating a morning ritual that will help you automatize becoming your best self. A morning ritual is nothing more than a sequence of things and activities you do right after you wake up, and with time they become a habit you don’t even think about. We’ll not just tell you how to create a morning ritual, but a Super Morning Ritual that sets you up for greatness, gives you the right momentum and mindset. Creating a Super Morning Ritual is like creating a personal shuttle you will go with throughout your day, it’s a mental tool just like a shuttle is a tool for transport. When you go by your day within this shuttle, with the super mind space you have created for yourself, you will not be affected by the negativity of the environment and others. This Super Shuttle is created every time you go through your Super Morning Ritual. The Super Morning Ritual is constructed by 7 key elements. Making your bed is not just psychologically rewarding as you are tricking your mind that you have accomplished something, but you have a clean bed waiting for you. 2. 5 minute exercise and stretching. The first 10 minutes after you wake up it’s important to do a simple morning exercise, push ups, jumping jacks, basic stretching. Do this for 5 to 10 minutes max. 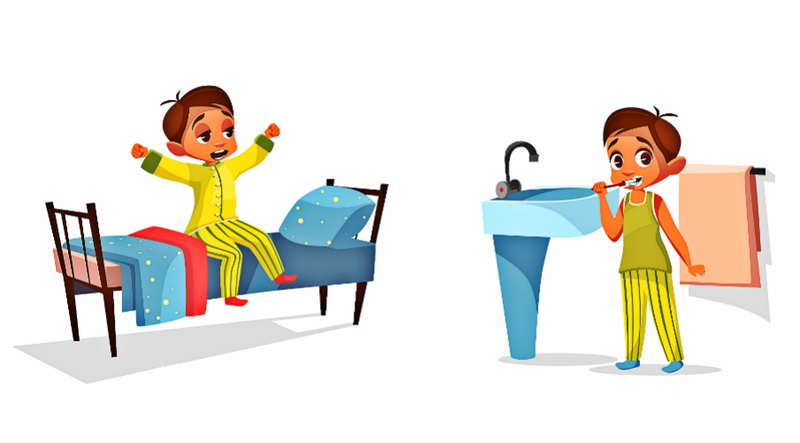 Your body is dehydrated when you wake up in the morning. After the exercise your body needs fresh water. Drink a glass or two to replenish it. This one might seem hard but once it becomes a habit it’s something you don’t even think about. Cold showers have countless health and psychological benefits. Sit and meditate for 15 minutes. Just let your mind do its thing and detach from your thoughts. Observe them. Give yourself a little mental vacation. 6. Think of 2 things you are thankful for. After the meditation think of at least 2 things you are thankful for. Start looking for things that you have. This shift of perspective is important. 7. Read for 15 minutes. And the last element of the Super Morning Ritual is to read something by a successful person, or watch a video. Feed your mind information coming from a successful mindset. All of this would take you somewhere from 45 minutes to an hour, so you should consider getting up earlier. Another thing we would add here as a bonus is after you do the Super Morning Ritual, if you can, do the hardest task you have of your day. If you do the hardest task in the first couple of hours after you wake up everything else will be easier during your day, and you’ll have a much more positive mood. But even if you only do these 7 things, you would have primed your mentality for greatness, you would have gained the positive momentum and mindset.